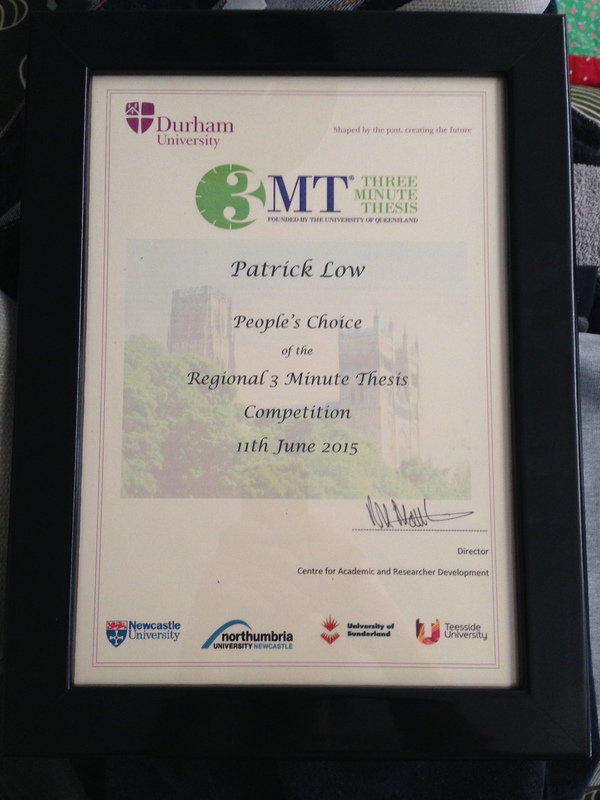 In my last blog, I mentioned that I had been entered into the 3 Minute Thesis competition, a national challenge in which you must summarise your thesis into a, noteless, three-minute presentation that can be understood by a non academic audience. The event was held at Durham University and, much to my surprise, I was lucky enough to win the People’s Choice award and another £100 for being the Runner Up. The overall winner was a female scientist who had done some truly incredible work on cures for male infertility. If there was an academic Top Trumps, I feel a life changing cure tops detailed knowledge of North East executions any day, so she was a very worthy winner! I should add, in case Professor Tim Hunt is reading, that I didn’t once see her cry and I think I can safely say she didn’t fall in love with anyone present in the audience. Aside from this unexpected award, June has been by far the most unproductive month of my PhD to date. I remember early on in my first year being constantly told that there will be a lull in the second year, which you have to fight through. I just didn’t think mine would come so early. The combination of a bad cold, a PhD writing course, unexpectedly sad personal news and the impending deadline of a paper I am presenting at an International Conference in Belgium, has led to a sort of PhD paralysis in which I cannot seem to write. So, I can only apologise for the gap in entries and lack of interesting insight in this blog. Instead I thought I’d make a quick point about learning itself. Ironically, given my recent inability with a pen, I have been attending a cross-disciplinary writing programme, which has been immensely useful. Perhaps it has been the process of analysing my writing that has led to this dearth in output. I think I am now being far more considered about what I write (except on this blog!) and that in turn is leading to a block in my writing. What was fascinating about the course was how often PhD candidates associate academic writing as being separate from something that is ‘interesting’ to read. I am guilty of this myself, if something sounds too engaging and interesting it’s probably not ‘academic’ enough. That’s clearly a nonsense, but it speaks to a wider problem in academia. People in academic institutions often complain of the increasing requirements placed on them to think about ‘impact’ and ‘public engagement’ in their work or funding applications, but I find this reaction bizarre. What is learning for, if not to expand our collective understanding of the world. There is a huge thirst for detailed and specialist knowledge (one need only look at the popularity of TED talks) and we should be privileged that we can provide it. I am particularly fond of Hector (played by the Richard Griffith) in Alan Bennet’s History Boys and his philosophy of learning. Pass the parcel. That’s sometimes all you can do. Take it, feel it, and pass it on. Not for me, not for you, but for someone, somewhere, one day. The remarkable thing about PhD study or indeed any detailed research is where it ends up being applied. I am constantly fascinated by the studies or books I end up reading and am convinced that the authors couldn’t have possibly known that their work would have relevance to a study of North East execution. The Three Minute Thesis competition was proof for me that any study, however detailed can be engaging to an interested bystander, such as myself. It’s all in the presentation. Hopefully the next blog will be back to normal or at the very i’ll have some nice photos of Belgium to show you.